Werner Vega, President of APSPR (Puerto Rico Professional Surfing Association) announced that the Puerto Rico Tourism Company has partnered with Corona Extra to confirm a prize purse of $37,000 for their event on October 8 & 9, to be held at Playa Middle in Isabela, on the Northwest coast. This represents an increase of 240% over the largest prize money ever awarded before at a Puerto Rican contest. $25,000 in prize money will be awarded to the Men and $12,000 to the Women surfers. The addition of major sponsorship from the Puerto Rico Tourism Company shows a huge commitment to the sport and its athletes. The Corona Middles Pro will also be the third and final event on the ratings for the season, which will decide the 2010-2011 APSPR Champions. Currently leading the ratings are Brian Toth, 26, from Isabela and Lisalie Gonzales, 23, from Canovanas. 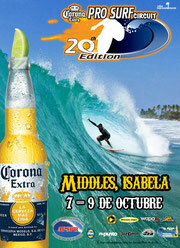 Both Toth and Gonzales were the winners of the 2010 Corona event at Middles, and have maintained their lead in the rankings through the last event, held at Domes, in Rincon, in March of this year. However, the ranking points on offer for the upcoming event mean that both title races are far from over. Coming at the end of a very busy Atlantic hurricane season, organizers are hopeful that October at Middles will provide the strong Atlantic swells which make Puerto Rico the surfing mecca of the Caribbean. "The close proximity of Puerto Rico by air has made it the favorite winter destination for East Coast surfers from the U.S., especially the Northeast", said Vega. "New Jersey pros Matt Keenan and Jason Reagan are regular visitors, and are again expected at Middles. Florida pro Jeremy Johnston took second place at Domes this spring and should be back, along with Amy Nicholl, who won the Women's event". For competitors: "All entries should be received with payment no later than Wednesday, September 28, 2011. Past Wednesday September 28 a late entry fee of $35.00 will be charged, announced APSPR Executive Director, Viviane Vega. "Entry deadline is Saturday, October 1, 2011 at 4 p.m. For more information visit APSPR website, or call: (787) 872-2490 between 10 a.m. and 5 p.m. Tuesday through Sunday". In addition to both days of surfing competition, Corona Extra will feature nighttime entertainment at several locations throughout the host town of Isabela, ensuring that the fun will continue around the clock all weekend.